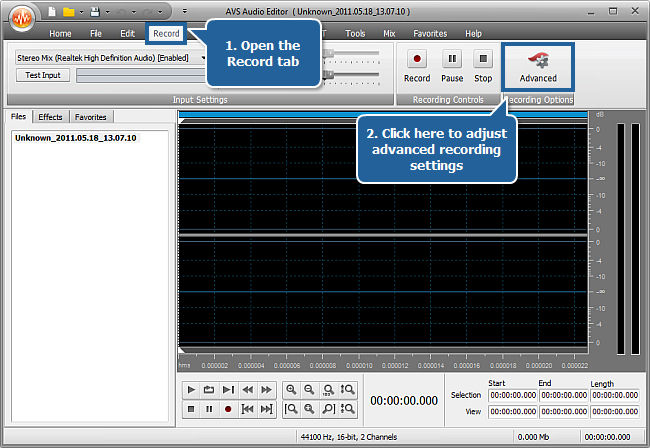 How to record music with AVS Audio Editor? 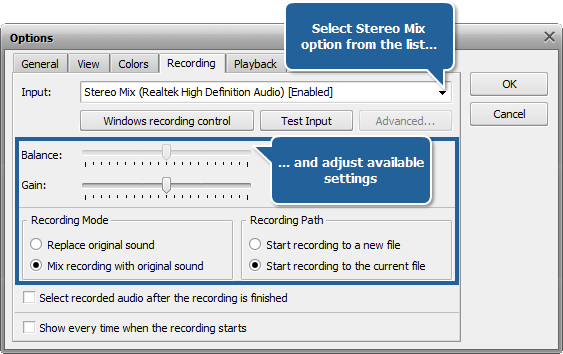 If you need to record music or any other sounds produced by the computer you can use the Stereo Mix feature of your computer sound card. 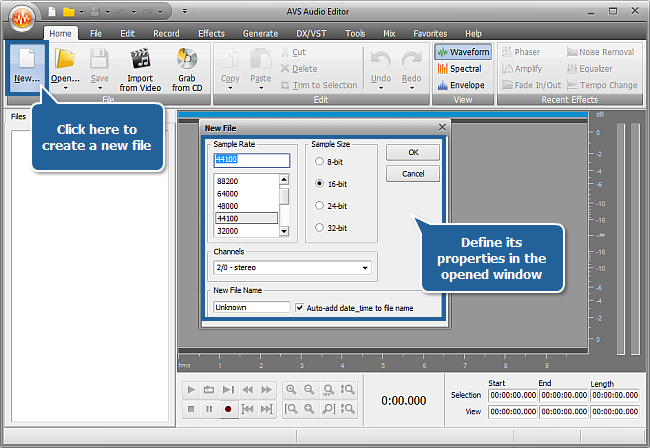 AVS Audio Editor will help you perform this task. Click the New... button on the Home tab of the Ribbon Command Bar. 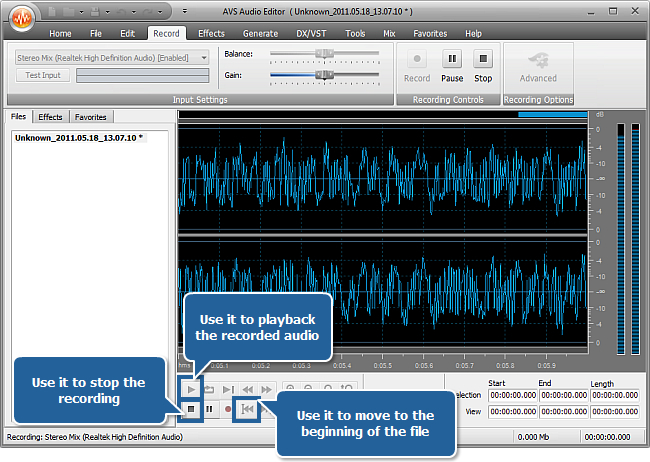 The New File window will be opened allowing you to define file properties that will contain the recorded audio data. The following parameters are available: Sample Rate, Sample Size, Number of Channels and New File Name. Use the OK button to save the selected parameters and close the New File window. A new empty file will be created. Open the Record tab to be able to adjust recording settings. The Options window will appear with the opened Recording tab. Select the Stereo Mix option in the Input drop-down list. Recording Path - specify the file where the recorded audio will be saved to. Select the Start recording to the current file option to record your music to the created file. Note: some settings can be disabled depending on the operating system installed on your computer and your sound card. 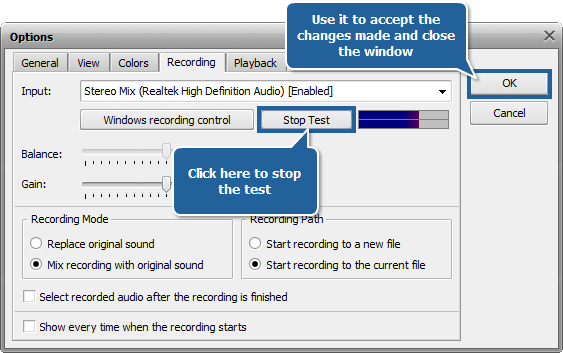 If you are using Windows Vista or 7, click the Windows recording control button below this drop-down list and proceed to Point 5. If you are using Windows XP or 2003, click the Start menu button and open the Control Panel. Open the Recording tab in the appeared window. Make the right click within the Recording empty area and check the Show Disabled Devices option. The Stereo Mix device will be shown, enable it by clicking the right mouse button on its icon and checking the corresponding option. To make sure that the volume level of the original sound signal is enough to record it and the Stereo Mix works properly, click the Test Input button. You will see the blue lines inside a special box move and change shape. Each line corresponds to a channel. When you are through with your test, press the Stop Test button. Then click the OK button to apply the changes made and close the Options window. To begin the recording process click the Start the recording button at the bottom of the program window. Don't forget to start playing the music that is supposed to be recorded (e.g. load a media player or Internet radio). The Volume Indicators on the right display whether or not the level of the signal coming from your sound card is strong enough during recording. 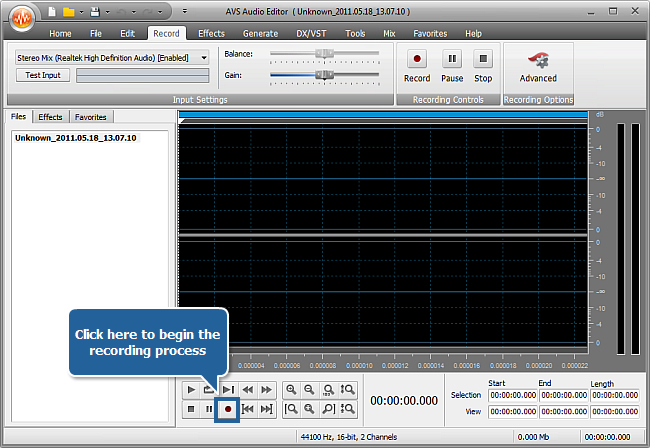 As soon as you finish the recording process, press the Stop the recording button at the bottom of the program window. To playback the resulting audio file click the Go to Previous Marker button to play the track from the very beginning and then press the Play button.